This fabulous Ideas project was developed by LEGO 7, and he was kind enough to answer some questions about his Working Dogs models. Keep reading to find out more about these incredible canines! My name is Hsinwei Chi aka LEGO7, a LEGO mocer from Taiwan. I am a graphic designer and illustrator who have been around magazine industry for more than ten years. I have been highly interested in my LEGO creations since I bought LEGO brick boxes for my daughters three years ago. According to the Chinese zodiac, 2018 is the Year of the Dog. I built different dogs out of LEGO Bricks to celebrate the Year of the Dog. As humans our faces offer a wide range of options when it comes to expressing our feelings. But when it comes to dogs, things can be a tad bit more complicated as their facial muscles aren’t as developed as ours. The facial features were the biggest challenges I knew that they had to be recognizable and entertaining and be in scale with the rest of the model. Working on their faces took me a couple of hours to get them looking right. How did you choose which dogs to build for the project? It's a great opportunity to educate many about the contributions of working dogs in our daily lives. Do you have a personal favorite of the dogs? I actually am a cat lover, and I have two cats. How long did they take you to design? They were complicated models and I took some time to design them. After the design was finished, I started building the models and made some adjustments. It probably took me one month to get them exactly as I wanted. Do you have any other dogs you would like to add to this collection? Doberman and Labrador are suitable for this collection too. They are highly energetic and sensitive and respond great to love and praise. But for my cat-loving daughters, I will make more LEGO cats. Thanks for sharing more about the Working Dogs project! 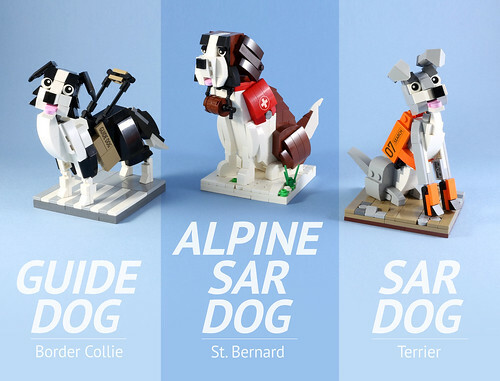 If you would like to see these dogs potentially turned into an official LEGO set, support the project now on LEGO Ideas.